Selecting the right kegs for your distribution goals and budget is not to be taken lightly. This resource content will help guide you through the process of buying kegs and follow up with a few tips about how to treat your kegs to ensure a long, trouble-free life once you own them. * In 1971 a British consumer organization called the Campaign for Real Ale (CAMRA) was founded, to protect unpressurised beer; the group devised the term real ale to differentiate between beer served from the cask and beer served under pressure. By 2004, the term real ale had been expanded to include bottle-conditioned beer, while the term cask ale had become the accepted global term to indicate a beer not served under pressure. How does a beer keg work? A keg is an airtight barrel. In the center of the modern Sankey style keg is a valve attached to a long metal tube that extends just short of the keg bottom. Extracting beer from the keg is accomplished by introducing CO2 (or Nitrogen) pressure through the coupler attached to the keg’s valve to the top of the liquid contents. That pressure forces the liquid down and up through the metal tube and out of the other side of the valve ultimately dispensing from the tap in the bar. A cask is not a keg. The keg is built with a center down tube with a valve that forces gases out when filling and in when dispensing. Kegs are pressurized with carbon dioxide or a mixture of carbon dioxide and nitrogen gas. 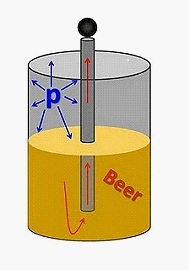 kegs have a simple concave bottom, the concavity allows for sediment to be captured away from the flow pipe in the keg. Casks are simply gravity-fed for the dispensing of liquids. A cask is flat on the bottom and a tap hole near the edge of the top. The spile hole on the side is used for conditioning the unfiltered and usually unpasteurized beer.